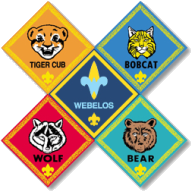 Blue & Gold Banquet - Please join Pack 94 in celebrating Scouting Anniversary Week on February 16th with a "birthday party" called the Blue & Gold Banquet. In nearly all packs, the blue and gold banquet is the highlight of the year. It brings families and friends together for an evening of fun and cheer. The purpose of the blue and gold banquet is to celebrate the pack's anniversary, thank pack leaders and other adults who have helped the pack, and inspire the Leaders, Scouts, and Parents. Please RSVP by completing the online form. Scout advancements and Entertainment to follow dinner!